Hey all, today’s guest post on getting clients as a music teacher was written by Jason Banner. Teaching is something I have over a decade of experience in, and though I left it behind to pursue other ventures, I know firsthand it can be a good way for musicians to earn money on the side. 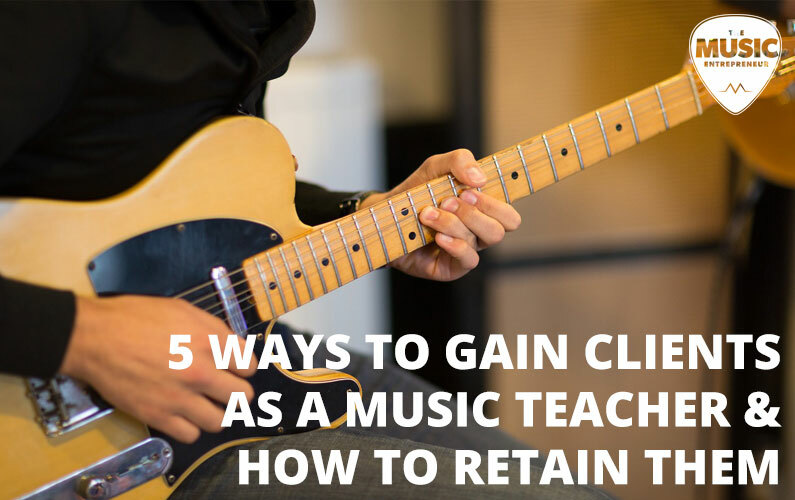 Here are several tips to help find and keep music students. Thanks for contributing, Jason, and if you feel you (yes, you) have what it takes to write a guest post for us, let me know. In today’s economy, music teachers need all the help they can get! Word of mouth and a flyer or two around town used to be all you needed, but that is no longer the case. The world has gone online and students have followed this trend. They’re finding music teachers online, taking YouTube music lessons, and using innovative teaching tools. Here are Five tips that will keep you competitive. Not sure how to start getting students? Here are five tips to explore. To be competitive as a music teacher you must have a website, period. This is, or should be, a complete no-brainer first step, but many music teachers are still reluctant to embrace this reality. Your website is a powerful business automation tool capable of saving you time and money if utilized correctly. Less time spent on daily administrative tasks means more time to teach and focus on your current students as well as finding new ones. It’s truly a win-win. Schedule and track student attendance, no-shows and make up lessons. Invoice and receive payments from students, as well as keep your finances organized and accessible for tax time. Mass e-mail all your students with important announcements. Allow you to give live, online video lessons. Write and publish blog articles to showcase your authority and attract students. Which Website Platform Should You Use? Use a platform that is easy to update, such as the industry standard WordPress, and make sure that you understand how to use it and update your website yourself. WordPress is an open source content management system that allows for virtually endless customization of both look and functionality. While WordPress is great, and does have an easy-to-use admin dashboard, it isn’t always as intuitive as one might hope. For the less tech-savvy, options like Music Teacher’s Helper offer a one-stop-shop for music teachers. MTH provides websites with many basic functions common to the music teacher profession built right in and can be had for a modest monthly subscription fee. Allowing your students to connect with you on Facebook allows their friends to see the connection. This is the new word-of-mouth and is even more valuable as it is a permanent record – not a fleeting few words like a conversation. Start out by creating a page for your business, getting your friends and students to follow you and make regular posts. Expanding to Twitter, YouTube and Pinterest can be your next steps. Make sure that all your online marketing efforts connect to your website as it is where all your critical information should live. Not only is this a great way to attract students, it is also a great way to get students to talk about your studio. You can try giving away an iTunes gift card, a free lesson or a little musically related gift such as free guitar picks. Not only will this motivate students to attend your studio and meet whatever criteria you establish for winning these prizes, but it can also make for some great content for sharing on your online marketing platforms. A music club, or even start one that you lead yourself. A local retirement community on their entertainment days. Keep in mind that everything you do is not only a chance to meet people in the real world, but is also content that you can share online and get new fans through the “feel-good” aspect of this type of work. Giving students one free lesson can help them see the worth of how you teach. Hands-on experience is better than any bit of word-of-mouth when it comes to convincing someone to use your skills. You will likely want to do this sparingly, as a free lesson is time when you’re not making money, but when you need new students this can be a great way to draw in new students. Again, this is the kind of thing people like to share with their friends online. Jason is a guitar player, teacher, digital marketer and lover of world music. In his spare time, you may find him exploring some new digital marketing tool, trading and studying the latest cryptocurrency trends, or playing a sitar in India with some guys with long beards.